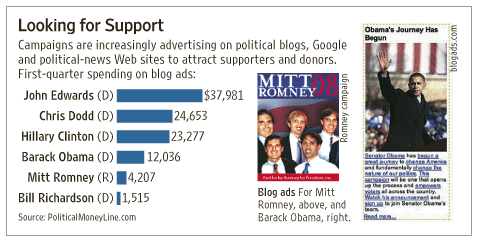 John Edwards led the pack of 2008 Presidential candidates in blog ad spending, which is sure to heat up as the campaign goes along. Because it is possible to tightly focus on niche markets and to instantly assess results, blog advertising provides great bang for the buck. Being from Australia, it is really quite fascinating following the USA presidential elections. IN particular how candidates are utilizing social media. In research for a podcast, I was doing research on Australian politicians and how they are utilising social media (Australia has a federal Election this year also). Noticed I could only find one blog out of over 200 members of parliament. Seems like our local politicians have a lot to learn! I thought that Australia was pretty into new media? it’s going to be fascinating to see the impact the Internet has on the American elections. So much money will be spent. But so far, no voice rings true to me the way John Dean’s did. Yeah we are pretty into new media. But our politicians have a certain affinity for the 1950’s (a little backward to say the least). I think what is also interesting is just how seamless it all seems in regards to politicians embracing these new platforms, and voters accepting / demanding more involvement also.